You don't really think too much of this at the time (in fact I found it a little mundane and typical) but all the set up for Andrew's home life becomes significant in his character's development through out the film. The story is told entirely through footage recovered either from Andrew's own camera or the cameras of others - even news footage. It works quite well but I found myself thinking for some scenes, there's no way that footage came from anyone's camera. I think the director decided a few regular film sequences wouldn't spoil the found footage quality he was going for. Not that that is a big problem. District 9 starts out with all documentary footage then transitions seamlessly into a more conventional film as it progresses. In Chronicle however, I think they slipped in a few conventional, filmed pieces and hope you won't notice it doesn't come from a spectator camera. The story arc of Chronicle is really well done. It takes you from the seriousness of Andrew's home life through the humor of the three friends experimenting with their power in some imaginative but very un-superhero-like ways. It then goes back to seriousness as each friend gets stronger and better at what they can now accomplish. One thing to note is that, at no time, does any of the three refer to themselves as a superhero or being like a superhero. Some people like that there is no reference to fictional superheroes but I can't help but think a teenage boys mind would make that connection faster than a speeding bullet. Imagine their dilemma of deciding whether or not to wear underpants on the outside! It's really hard to discuss what I like or don't like about this movie without revealing important plot points that may spoil your enjoyment of the film. I also don't feel compelled to nit pick and pull holes into a film that, overall works very well. 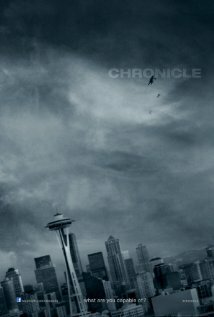 As I said at the start, if you like more realistically styled superhero films, a 'what if this actually happened' type scenario then Chronicle should be enjoyable to you. It's not your usual 'goodies and baddies' type superhero movie - which is definitely one of its strengths. The ending does set the film up for a potential sequel but it may not be the sequel you'd like to see. You'll understand that more depending on how you feel about each of the three friends by the end of the film - and which, you feel, had the most interesting character development. Definitely worth seeing in the cinema but not exactly essential. In fact one could make the argument that, seeing as the movie is supposed to be 'found footage' a further sense of realism might be achieved by watching it on a smaller screen like a TV. Which is how most of the footage would have been viewed if this had really happened. I'm happy that you mention seeing this film in the theatre is not essential. As a former, projectionist, this is one of the things that determine for me whether I'll wait to rent or run to the theatre for the silver screen dolby digital version. The coming attractions didn't do anything for me, but your review might get me to a early matinee instead of waiting. I've heard other people say that this is a 'must see in the cinema' type movie, which is why I mention it. Any movie is better in the cinema but not all are must see in the cinema. Only the final climactic scenes in this really make it a cinema experience. Some of the camera angles are quite distant in the final scenes so you can see the detail better on a bigger screen. Beyond that there's nothing you haven't really seen before in similar superhero type films. Most of which are just as enjoyable on a standard big screen TV. This movie won't disappoint you I think. However the previews gave the impression it was going to be more of Horror type film - which it isn't.